Quality Air Heating and Air Conditioning > Articles > Air Conditioning > Is Your Air Conditioner Blowing Warm Air? Your AC has one job to do, and one job only: cool your home. If you come home after a long, hard day of work, only to find that your home is just as warm as the front yard, you’ve obviously got a problem on your hands. Your AC may not even be broken down, but blowing warm air throughout your home. If this happens, there are a few different potential causes of the problem. 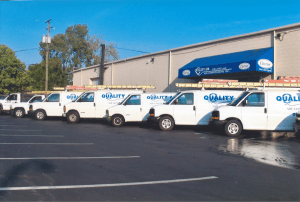 Be sure to dial our number if there is no obvious resolution, and let our technicians get your air conditioner in Columbus, OH functioning properly once more. The worst case scenario is refrigerant leaks. The refrigerant in your system functions as a heat transfer fluid. It evaporates in the evaporator coil, and that allows it to draw heat out of the air surrounding that coil. If you don’t have a sufficient amount of refrigerant in your system due to leaks — remember, refrigerant is never consumed by your system — then your AC will not be able to effectively cool your home. It can also lead to the icing of your air conditioning system, which will further insulate the coil and make it even more difficult for your air conditioner to cool your home. Of course, ice on the evaporator coil does not necessarily mean that your system is leaking refrigerant. You may also have a very dirty air filter in place, and that is a problem that you can both resolve and avoid on your own. When a dirty filter inhibits airflow enough, your system won’t have enough air to draw heat out of, which can lead to warm air and also ice developing on your system. The simplest of situations to resolve is just improper thermostat setting. If you set your thermostat too high, or if you’ve switched it over to the fan-only mode, you don’t need us to come right the problem. If your thermostat is actually malfunctioning and registering temperatures wrong, though, you’ll need professional repairs or replacement. Let Quality Air Heating and Air Conditioning handle your air conditioning services.